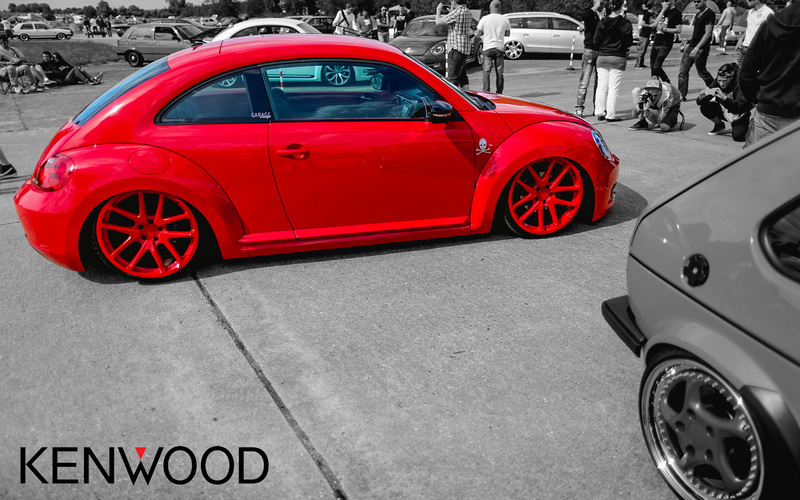 In December 2012 Kenwood UK took delivery of a brand new VW Beetle. A strange choice, perhaps, but with a little imagination and some Air Lift know-how, it became one of the most recognizable cars on the UK show circuit. The project was aimed at providing a showcase for Kenwood’s fantastic line of OEM-quality multimedia head units, but also had to have the right look. For the guys at Kenwood, it was no contest in the suspension department, and a newly developed Air Lift threaded body air ride kit was incorporated into the build. The first choice of wheels was Rota’s huge 19″ grid wheel. 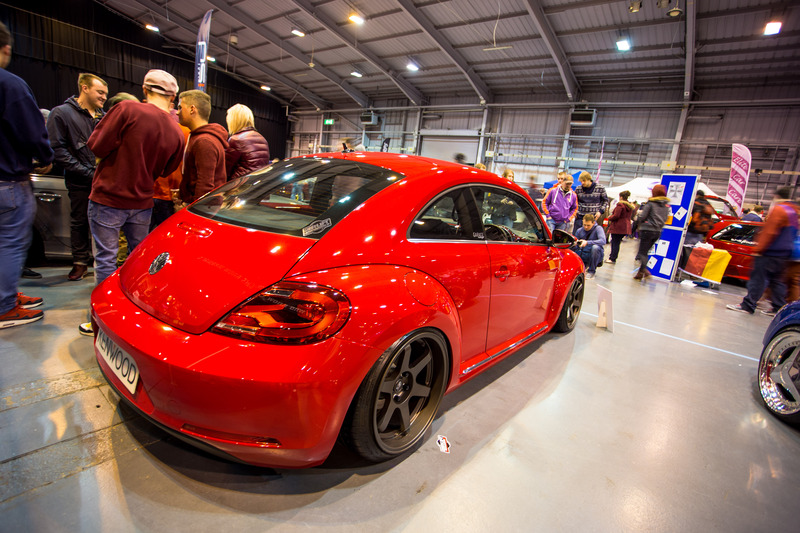 Measuring 10.5″ out back, a MK5 Golf GTi IRS rear end was fitted to allow the wheels to camber in as the car was dropped. This resulted in a perfect stance. 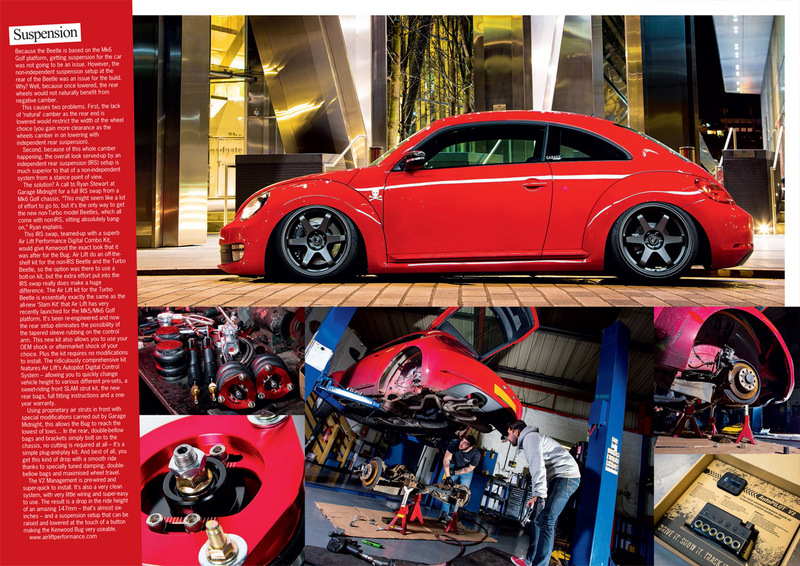 Not content with squeezing the 19’s under the Beetles arches, Kenwood then swapped to the 20″ Rotiform SNA wheels pictured above. This is probably the look most people will associate with the car, and the red-on-red scheme is pretty hard to beat!